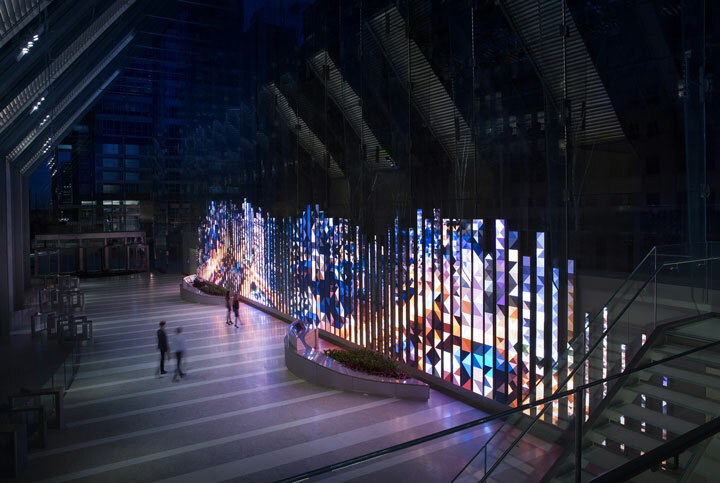 The 150 Media Stream ‘living sculpture’ created by Leviathan, McCann Systems and Digital Kitchen is a beautiful and impressive canvas for digital artists, as well as Chicago’s largest video wall. 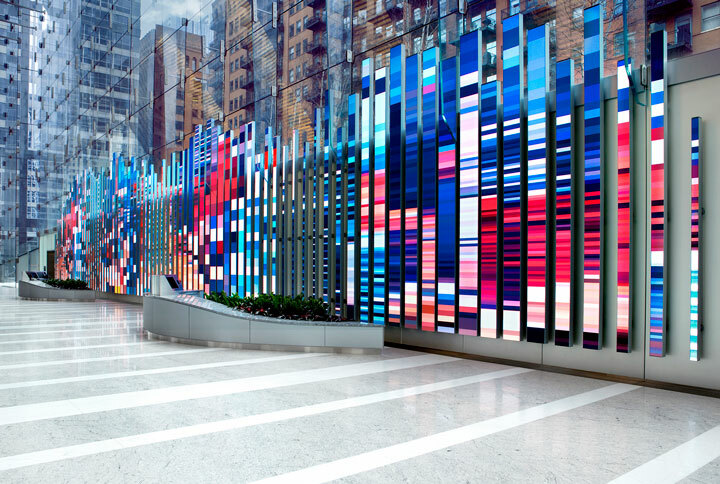 With its permanent home in the lobby of Chicago’s Riverside Investment & Development’s 54-story office tower designed by architect Goettsch Partners, the installation represents a massive 3,000+ square foot canvas for experiential artwork. 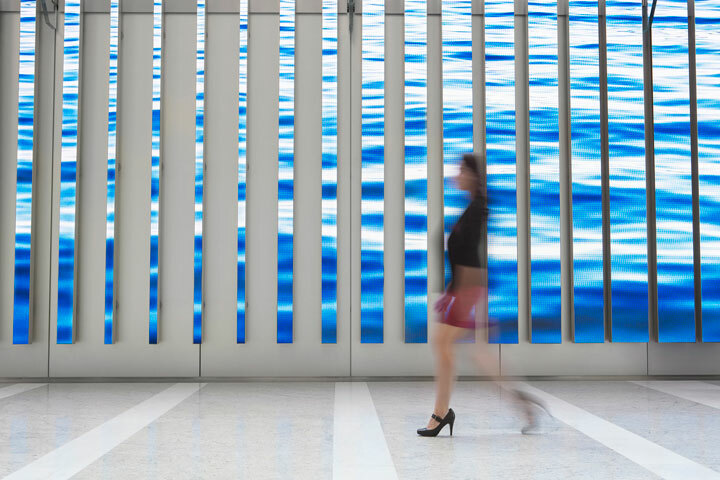 Curated by Riverside’s Creative Director Yuge Zhou,150 Media Stream is composed of 89 individual vertical LED displays of various heights and widths, as well as integration of negative space between each blade. The display system was designed by McCann Systems in cooperation with Digital Kitchen, while Leviathan was commissioned to produce the content management system and contribute video content. 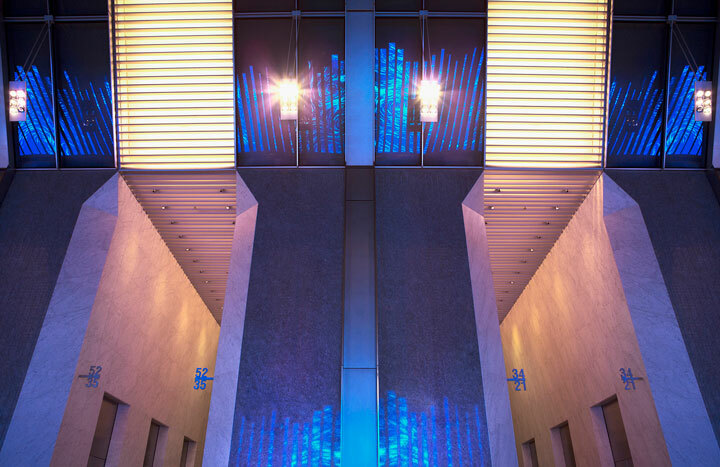 The physical aspects of the installation were conceived and rendered relatively early into the process by McCann Systems and Digital Kitchen. For Leviathan executive creative director Jason White and his colleagues, the initial focus was on the installation as a three-dimensional sculpture set within a very unique environment. According to White’s description, all video aspects of the installation were specifically conceived to complement spatial and environmental concerns. “The video elements were designed as integrated components of a sculpture that addressed everything from the shapes of the video blades to the physical surroundings of the entire installation,” White revealed. 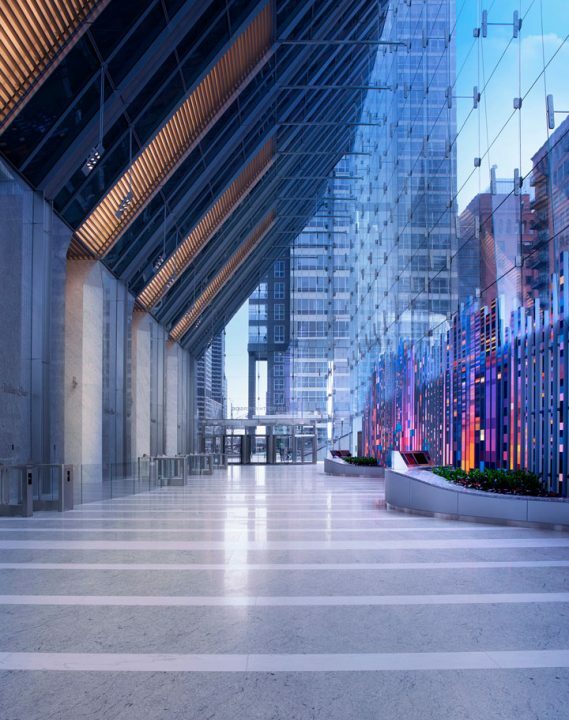 After establishing technical specifications to standardise the submissions of an impressive list of artistic contributors around 150 North Riverside’s contemporary holistic vision, the Leviathan team became contributors themselves, shooting, animating, editing, coding and orchestrating multiple data sources. In the hands of White, creative director Brandon Webb, and a team of specialised producers, engineers, designers, developers and artists, the deliverables evolved into an intelligent content library that will continue to transform over time – using generative algorithms to heighten originality and relevance, the feed is programmed to address seasonal, monthly, weekly, daily and even real-time considerations. Since even the design of 150 Media Stream is unprecedented, McCann Systems’ job in bringing it to life involved weeks and weeks of research and feasibility studies. “To address the many cutting-edge aspects of this project, we had to work closely with several manufacturers to design and the fabricate most of the physical components of the display, including everything from the printed circuit boards to the custom display cabinets,” said Frank McCann, president and CEO of McCann Systems. While the installation’s engineering and fabrication played out, Leviathan was still obliged to continue development of dynamic content. Responding to these challenges, Leviathan’s Webb and his teammates devised a solution using Epic Games’ Unreal Engine 4. “From end-to-end, our software toolkit involved using Derivative’s TouchDesigner, GLSL shading language, Adobe’s After Effects and Photoshop, Side Effects Software’s Houdini, Autodesk Maya and Maxon’s Cinema 4D,” Webb explained. As this proved so helpful in honing in on the best content for the space, Webb said the process will probably be repeated for future projects.